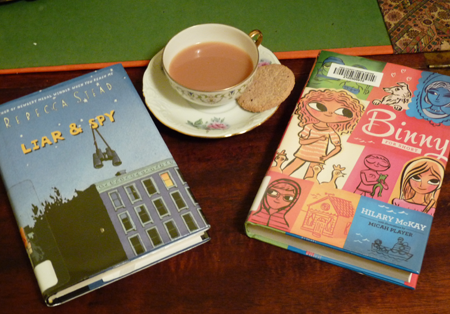 Two lovely books to review today. Both deal with the characters' difficulty accepting the loss of their old lives and embracing what their new lives hold. Belinda, Binny for short, is eleven and lives with her mum, older sister Clem and younger brother James. She divides her life into two parts, before her father died when life was easy and after his death when it was time to grow up. Her father's death left them in emotional and financial turmoil. It also meant the loss of Binny's dog. Things seem to be changing when circumstances lead them to a haunted house in a seaside town. James, one of the best characters I've ever met, loves life by the sea. His sartorial choices are logical only to himself. He is funny and horrible in the way small boys can be. Clem takes life as it comes and finds ways to pay for her own music lessons. Binny declares the boy next door her enemy; of course they have to dare each other to ever more hair-raising exploits. Hilary McKay has a knack for creating unique characters that seem so absolutely real that the situations they fall into in make a loopy kind of logic. Seventh-grader Georges (not a misspelling, his parents like Georges Seurat) has endured a lifetime of teasing over his name. Now because his father lost his job, his family has sold their beloved house and moved to an apartment. His mom has volunteered for extra shifts at the hospital. Georges feels isolated at school because his childhood friend now sits at the cool table with the bullies. His dad sees a notice in the apartment basement for a spy club. Georges meets two kids from a bohemian family, Safer and Candy. Safer sets about training Georges to spy, especially on the mysterious man who dresses all in black and carries suitcases out of the building. Georges tries to circumvent the bullies at school and to resist Safer's increasingly dangerous surveillance techniques.